How funny you mentioned this. I just called China this morning asking the same question. Because Visa wasn't readily available, at one point I was doing a Master Card. It didn't take, and it took several tries before I got anything to work. But by then, I wasn't sure which card had been used. I called and asked which card was it billed to. The non-native woman speaking to me in English said they weren't able to see the card numbers used, and therefore couldn't tell me. Still, I show that I have a registration, and she confirmed it on the phone. If this is happening across the board, and they aren't collecting the money, they could be in deep, deep trouble. June 16 Tickets NO AVAILABLE! Screenshot from my pc (no phone or tablet), 2 days ago! It all depends on the moment. One minute they can be available, the other not. I was still able to purchase tickets for the 16th yesterday. 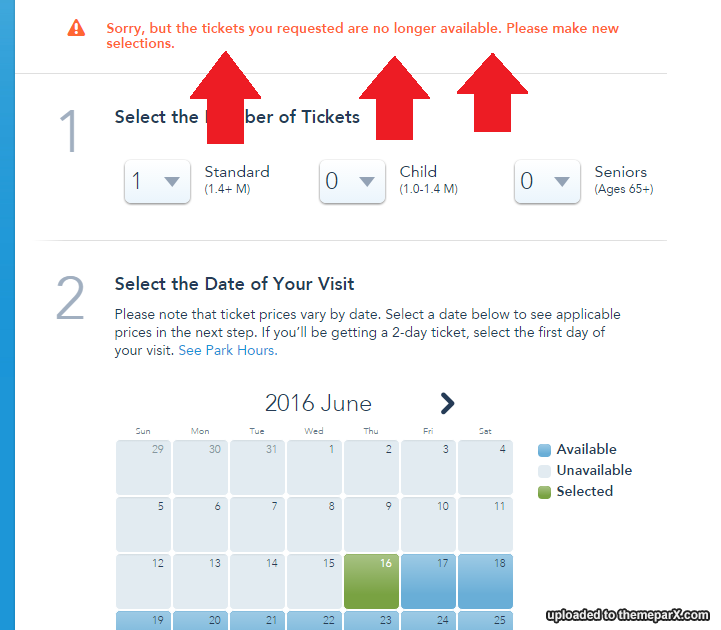 So I hope I can see any other Disney Park fans at SD on June 22-25,2016.. I can't believe we will all finally be there! Well, I made another reservation a few days later for the Toy Story Hotel as well and that one has been properly charged on my creditcard. It only showed as being 'reserved' for 5 days and it now shows the final, full and correct amount. Is it perhaps only to check if the card work? And full payment at the hotel during check out? Would love to get some information about this. I tried calling the reservation center but they weren't understanding my question as to if we have to pay in full in advance or is it just like when pre-ordering something online.. the check if your card is valid and charge at checkout? Did anyone else notice his/her creditcard charges made on March 28 missing from their statement? They showed up for 7 days as being 'reserved' but the payments weren't finalized. I called to Shanghai several times and they stated that my payments were successful. My creditcard company says the payments were never finalized by Shanghai Disney Resort and that I haven't been charged? Anyone else noticed the same thing? @isepa is using a desktop computer, and the anonymous poster below a smartphone. Maybe that's the reason? A bug?